The Cifal Asia-Pacific Network Meeting was held at the Jeju International Training Center (JITC), on Sept. 13. 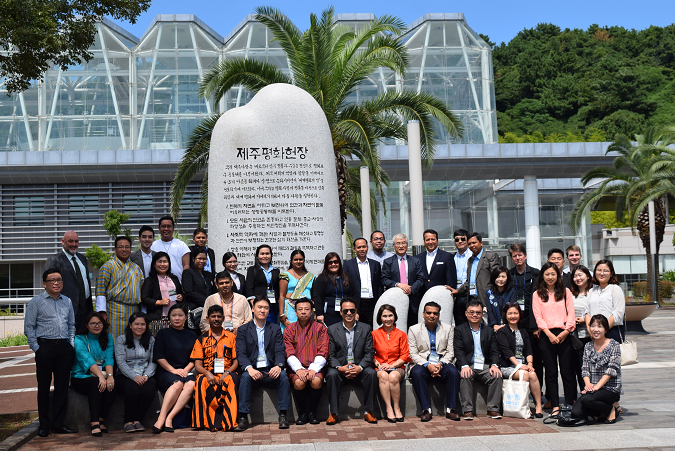 This meeting, initiated by UNITAR Cifal Jeju, brought all Cifal Centers in the Asia-Pacific region an opportunity to discuss the strategies for regional cooperation for the first time since the inception of CIFAL Global Network under UNITAR. * The Cifal centers are the training arm under the umbrella of the United Nations Institute for Training and Research (UNITAR). All Cifal centers agreed to further enhance the cooperation amongst the centers by working conjointly on projects and discussing arising challenges and opportunities faced by each one. Also, the Directors of the Cifal centers shared their views over the formalization of the Cifal Asia-Pacific Network as well as the launch of a new programme, which will be held in cooperation with UNESCAP(UN Economic and Social Commission for Asia and the Pacific) in order to further achieve the UN Sustainable Development Goals (UN SDGs). The Cifal centers endorsed great support for the joint program between Cifal Jeju and Cifal Newcastle. Additional efforts are expected to be developed with the collaboration amongst the Cifal centers in the near future. A basic format to facilitate this cooperation was also accepted in the meeting.